Lisa Steele is known as an expert in all things chicken-related. She has written several books, appeared on tv shows and in magazines, and maintains a website where she teaches about the ins and outs of taking care of chickens. 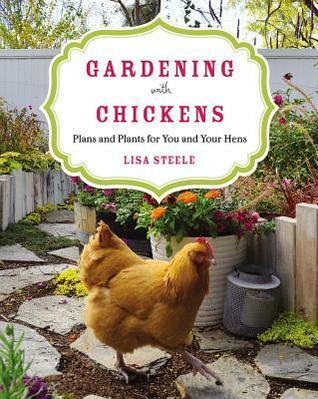 She is also a gardener and in Gardening with Chickens, she writes about all the ways that chickens can help your garden and your garden can help your chicks. So, you may gather that I'm thinking about getting some chickens. I haven't actually taken the leap of calling my local government offices and finding out if we are zoned for such things, but I am dreaming dreams of warmer mornings when the kids and I can go out and collect some eggs from the backyard. If you find yourself in a similar position, Lisa Steele's book is a great place to start. She may be an expert, but she writes clearly for the reader who might be new to chickens (or gardening). If we do end up adding some chickens to our home, I know that they can keep my garden healthy by turning the soil and that our garden scraps can keep the chickens healthy by giving them a varied diet. And it doesn't hurt that this book has a beautiful layout, with plenty of pictures of Steele's farm. Are you thinking about taking up gardening? Perhaps you already grow food or flowers, but are thinking about the possible effects of pesticides and chemicals on your garden. This book is going to take you from first thought to enjoying beautiful flowers and vegetables, all while reminding gardeners of the importance of gardening organically during every step of the process. This book reminded me a bit of a textbook. Author Mark Highland is taking a deep dive into gardening, which means you are going to know more about layers of dirt and organic fertilizers than you ever imagined. 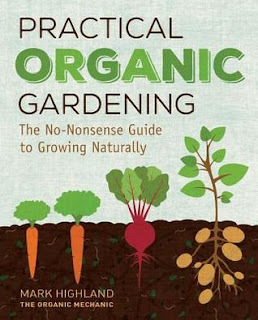 This is decidedly a book for the committed gardener who is ready to take some notes, as opposed to the person who wants to skim something light and simple. But there is a lot to break up the text too--there are plenty of pictures of beautiful gardens in full bloom, rows of vegetables in the middle of the process, quirky illustrations, and helpful charts.